The ProX / Xstatic T-LS35C is a triangle crank truss system. This medium duty truss lighting stand package includes two high quality crank up stands & three 5FT triangle truss sections that create a 5ft, 10ft or 15ft span. The crank stands can safely extend to heights of 10ft. A pair T-Adapters are included so you may easily mount your truss to the stands. The truss system can safely mount and hold up to 200 lbs of evenly distributed weight. Truss pipes are 1.5" in diameter. Truss sections are 6 inches in overall width. Bright, compact, and lightweight LED moving head perfect for mobile applications. Super crisp optics and even output. Energize the dance floor with fast and precise movements. Increase design flexibility and effects with separate color and gobo wheels. 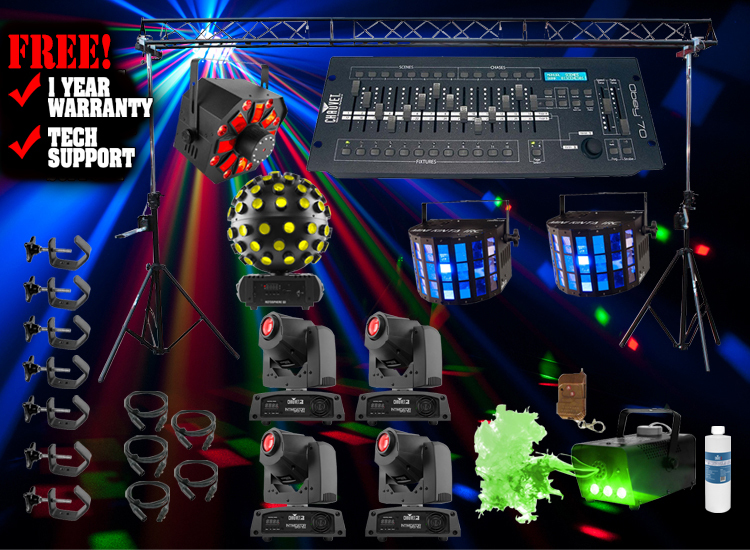 Enhance any light show with super smooth dimming and adjustable strobe speed. Minimize programming time with built-in movement macros and move-in-black features. Individual reset of pan/tilt, color, and gobo. Generate a synchronized show in Master/Slave mode with easy-to-access, built-in automated programs. Fits best in the CHS-X5X VIP Gear Bag. The complete system when assembled weighs approximately 92 lbs.